Looking for a trendy handbag but don’t want to break the bank? 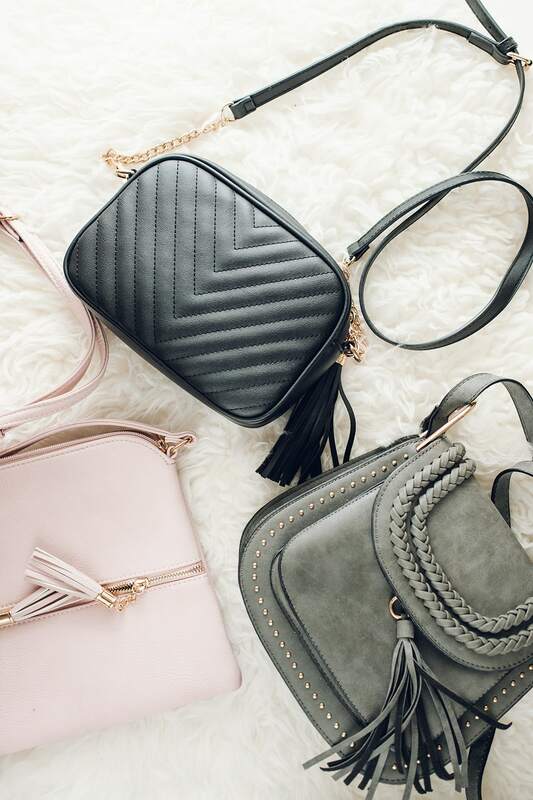 There are so many cute and cheap Amazon purses you can find for under $40! I know we all have a love affair with Amazon. Sometimes I don’t even bother if I can’t get what I need with that amazing 2-day shipping. My life basically revolves around our Amazon Prime subscription. Relatable? Haha. I have to say, I have found the cutest purses on Amazon! Lots of designer dupes and really high quality stuff. I’m not much of a “luxury” girl, but I do like looking as if I care about trends. I enjoy keeping up without the splurge. I’ve always been that way (hence all my drugstore makeup dupe posts). I have been so pleasantly surprised by the price and quality of the Amazon purses! I’ve ordered a handful of them and plan to continue. For this blog post, I’ve rounded up 5 of my favorites – 3 of which I have bought and 2 that are highly-rated and on my shopping list. This is a really cute Chloe dupe! In fact, someone complimented me on my “Chloe” at an event. I felt like a fraud and I was like “yeah, um, I got this on Amazon for under $40.” Haha! I have the gray one, and it goes with everything, and can also be worn year-round. I would say that this bag fits the least amount of items, but it still fits the essentials. This little handbag gives off YSL or Gucci vibes. I like the simplicity of it, that it comes in a multitude of colors, and is under $20! It fits quite a bit (my phone, wallet, keys, compact, lipstick, and a few extras). I’m currently carrying this one around in black, and have been complimented on it a few times. This is on my wish list! It looks a heck of a lot like one I got from Nordstrom for quite a bit more. (I also have to say it looks a lot like the Madewell totes, too.) The reviews on it are also amazing. I love that you can switch it back and forth from black to cognac and that it has a little pouch that comes with it. Not to mention, it’s under $35? Count me in. Here’s what my reversible tote looks like… it’s so similar! This is another Chloe-esque type bag that I’ve had my eye on. I like that you can wear it crossbody or backpack. It’s got such a cute and unique design to it. It has a lot of great reviews and it seems to hold quite a bit. Best of all, it’s under $25! I am 100% certain this is next on my list to purchase. Did you enjoy this blog post and want to save it for later? Be sure to pin this image!